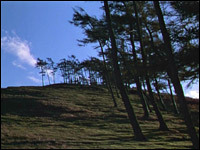 One of the distinctive features in the films of Michael Powell is the attention paid to landscape and geography. Powell grew up in rural Kent, and he retained a passionate love of Britain's countryside which flavoured his approach to filmmaking. Powell 's expressive use of natural imagery harks back to a romantic literary tradition - whose notable exponents include Thomas Hardy and Emily Brontë - in which nature in its wildness both reflects and determines the emotional life of the protagonists. The Phantom Light (1935), a routine comedy thriller set around a Welsh lighthouse, was an early sign of the young director's feel for geography. Powell invested the windswept cliffs and seascapes with a genuine mystery and menace which belied the weakness of the plot. Powell 's breakthrough film The Edge of the World (1937), was the first of three films set in remote communities in the Scottish Isles. Based on the true story of the evacuation of the island of Fuola, the film presented with unusual sensitivity the islanders' noble, but ultimately doomed attempts to defend their traditional way of life in the face of the 20th century's economic and social pressures. It also evocatively captured the fierce beauty of their home. Powell was back in Scotland for The Spy in Black (1939), his first film with Emeric Pressburger , which again demonstrated his eye for finding wonder in rough terrain, while in "I Know Where I'm Going!" (1945), the elements - rain, fog, gales, even a whirlpool - conspire to prevent an ambitious London girl from marrying an older man for his money. Stuck on the mainland while her fiancé waits on his island, she gradually succumbs to the charms of the handsome local laird. Powell seized the opportunity provided by Pressburger 's script for 49th Parallel (1941) to represent the vast diversity of the Canadian wilderness. But it was A Canterbury Tale (1944), again from Pressburger 's original idea, which most clearly set out Powell 's vision. The film became a hymn to his beloved Kent, following three modern day pilgrims on a journey to rediscover their - and Britain's - lost spiritual heritage. Strange and poetic, A Canterbury Tale combined Christian metaphysics with a celebration of England's rural past that at times seemed almost pagan. Like Hardy and D.H. Lawrence , Powell used nature as an analogue for passion, and this was most explicit in the heady, erotically-charged Black Narcissus (1947), and in the Hardy-esque Gone to Earth (1950), adapted from a novel by Mary Webb . In Black Narcissus , Powell 's decision to recreate an Indian Himalayan outpost on a Pinewood stage - with 'jungle' sequences shot in tropical gardens in Kent - didn't prevent him from conjuring a rich but uncompromising territory, reflecting the film's oppressive feel. The weird atmosphere of the desolate, windy convent - a former house of concubines - unsettles the nuns, raising tensions and bringing to the surface long suppressed passions. Gone to Earth populated its raw Shropshire countryside with an almost fairytale cast of innocent young maidens, malevolent lusty squires and well-meaning but foolish vicars. It concludes with its heroine, pursued by hounds alongside her pet fox, literally reclaimed by the earth when she falls down an abandoned mine shaft.